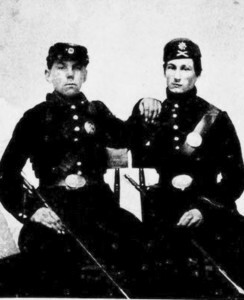 Frank A. Burrill (on right)(1843-1918) is listed as a nineteen-year-old drummer on his July 1861 enrollment papers, but he was likely a year younger. He served in Company I of the 1st Massachusetts Heavy Artillery, under Andover’s Captain Jeremy B. Wardwell. Regimental records indicate that he “carried a musket” after the Battle of Cold Harbor in June 1864 until his discharge on August 16, 1865. After the war, Burrill married Lucy A. Hages and lived in Lynn with the couple’s five children. He worked as a shoemaker, a teamster, and from 1888 to 1911 as a Lynn city policeman. Shortly after his retirement, he was involved in an odd incident in which his service revolver was stolen from his Fair Oaks Avenue home and used in a locally notorious murder. He was active in veteran’s organizations and was present in 1912 at the dedication of the tablet honoring the 1st Massachusetts at the Essex Institute in Salem. He is accompanied by George Smart (on left) in the photo above.